Classic fairy tales are intended to teach an ethical lesson to children. They would tell the story of powerful, bold and handsome men who would rescue the damsel in distress. The women would be naive and without defense while the world around connived to subjugate them. ‘They Happily Lived Ever After’ would mean that these women would have gallant men come to their rescue and would be married. This shows that the princesses are prepared to assume their traditional gender roles of being passive and waiting for a male figure to save them. Their gender roles are suddenly shaken and re-evaluated when Fiona’s mother, the Queen, head butts the brick wall and creates an escape route. After this point the princesses feel empowered because they realize they can control their own fate without depending on a male figure. For years women have played by the rules and kept their heads down. As if being ‘rescued’ is a natural phenomena. But today, women take their own decisions about the way they want to live, how they want to carve their career and lead from the front. The reason they are ready to take on the ‘traditional’ role of the man being a ‘bread-winner’ is due to ‘self belief’. This behavioral change is making them leaders. 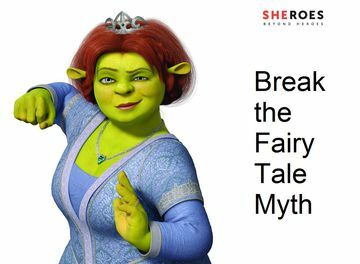 Women who become leaders have the same ‘self belief’ to ‘rescue’ themselves and dealing with the situation head-on – like Queen mother in Shrek 3. There are women leaders across industries, who have triumphed by just following their heart and pushing themselves to the limit because they believed, like men, they too can achieve. Many more are yet to come, but the numbers are increasing every day. And all women leaders have a common trait – in spite of adversity they believed in themselves and had the courage to go ahead to achieve their goal. We are burdened by the history of our past. But then opportunity to create and build a new world is only limited by our inability to enact in the future we seek. There are some unique qualities in women that make them work differently in work places than men. Women are more collaborative in their approach, hence are great team players. Their ability to balance work and personal life makes sure that they do not go overboard with anything. Lastly, women are more intuitive, have better EQ and hence pre-empt a lot of issues. Women should merge these positive qualities with “self-belief”, to be able to leave a legacy behind. I will list down 5 pointers that may help women who are looking to lead in the years to come. 2) Women who want to grow as leaders should also take ownership of their professional development. 3) Embrace opportunity – women must often take sharp detours and that the risks of unexpected changes that may seem more obvious than the benefits. 4) Becoming self-reliant and confident by accepting opportunities. 5) Expand your horizons and gain the resilience to move ahead even when things do not go the way you want it. This article was published here originally. Is India ready for women in public places? Is It Possible To Be A Successful Single Mother?